A friend called up for an urgent help. 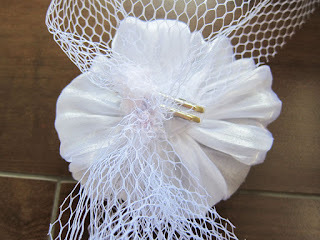 Needed a bridal veil for her pre-wedding photography session and she couldn't find a suitable wedding veil in time. She sent me a picture of her wearing her wedding gown, and a picture of a wedding veil that she would like to have. I told her instead of trying to find one, it might be easier for her to DIY one. 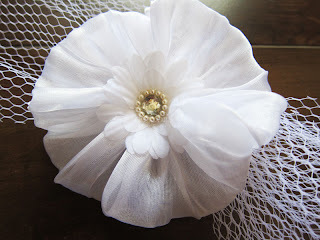 So off I went and hunt for something with WHITE fabric flowers, and boy was it hard to find something totally WHITE? You bet. It's easy to find stuff with creamy colors, it's extremely challenging to source something totally white, indeed. 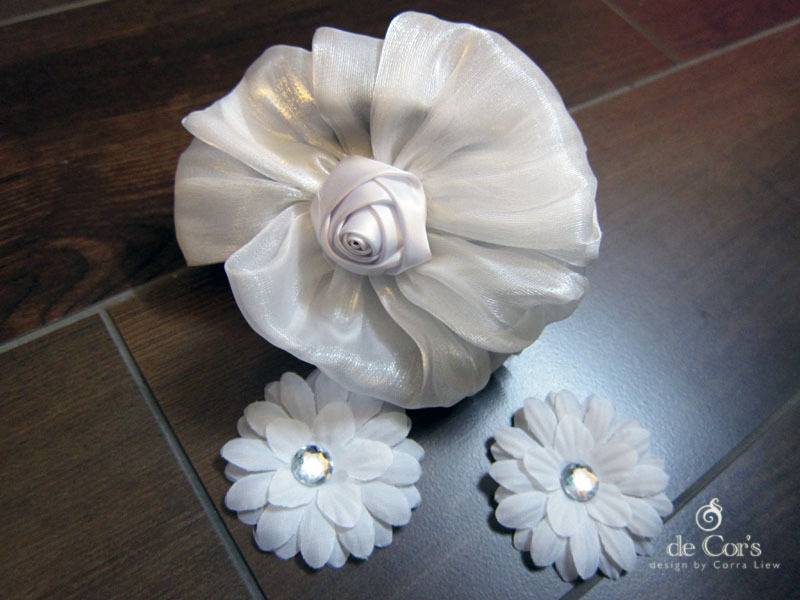 So finally I've found a hair clip with 2 huge white fabric flowers. Then I remember the supplier I have sourced my hair-clips and ribbons from have gave me some loose items as gift and there were two tiny flowers in white with "blings' at the center. I thought it would be perfect to put them all together. 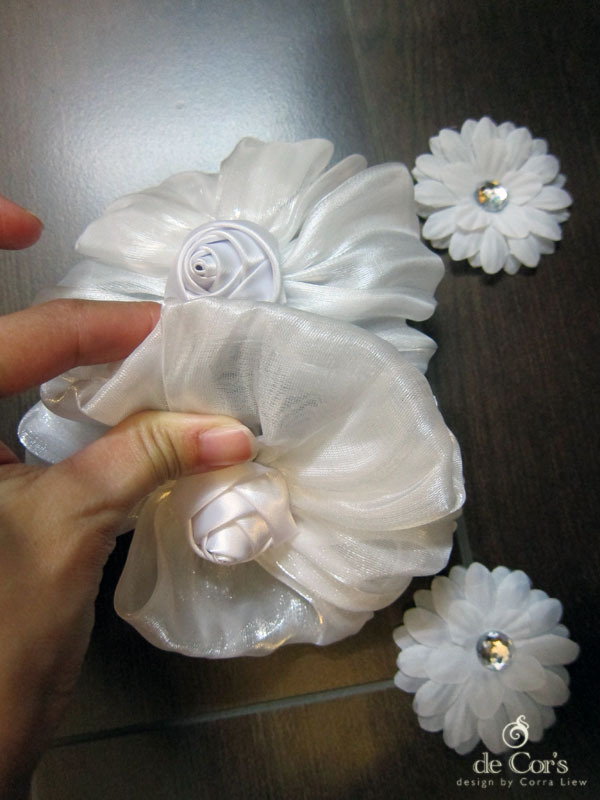 The flower was composed by collecting and gathering fabric with glue, of which I don't quite prefer. 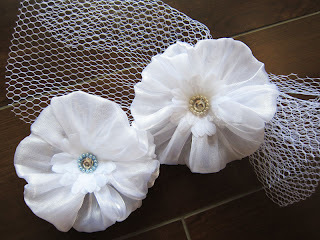 I tore them off from the hair clip, and spread opened the fabric, sew with with thread, then gather them again. 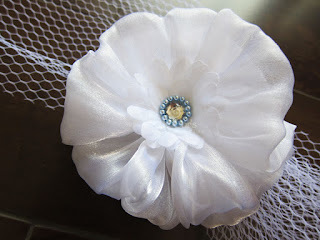 It's tricky to gather such thin and low density fabric, I am glad it turned out right after a couple of attempts. 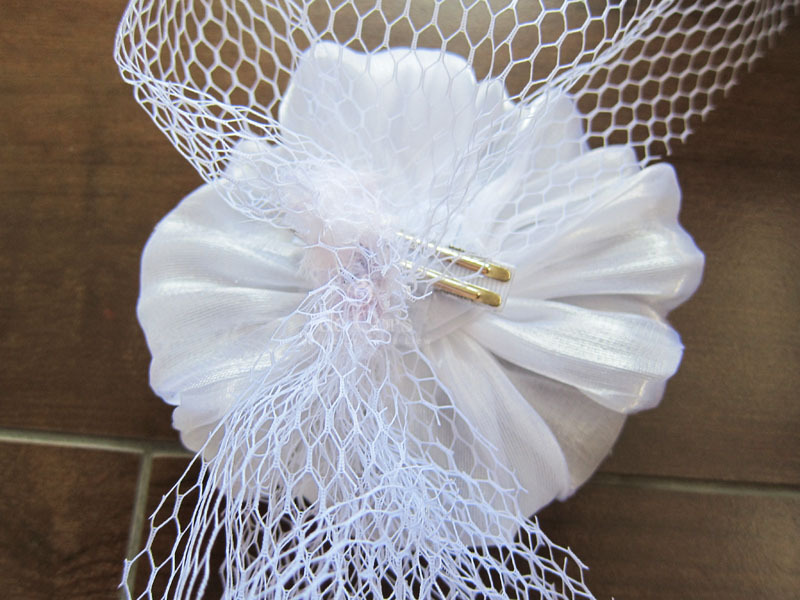 The friend bought a veil, and we ditched the original focal piece of that veil, took only the veil itself. 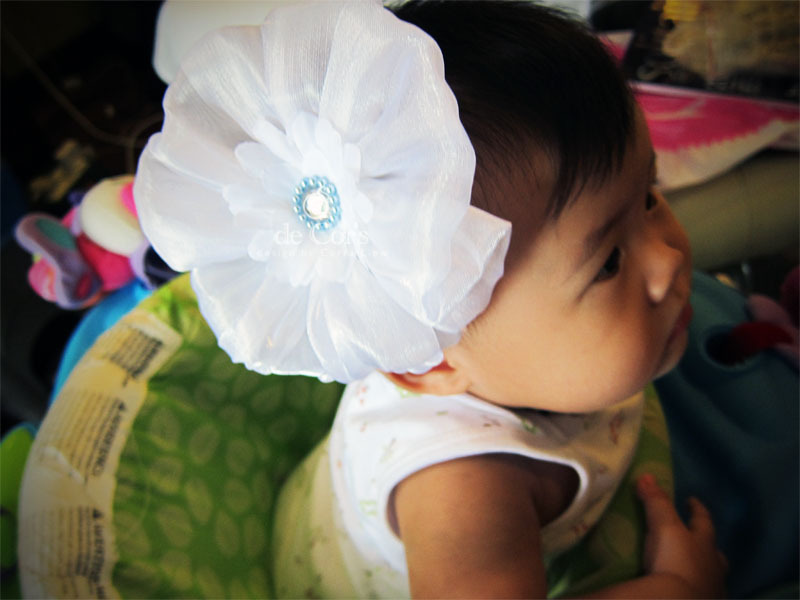 Because we have 2 flowers right now, she wanted one in white pearls and another with blue pearls. 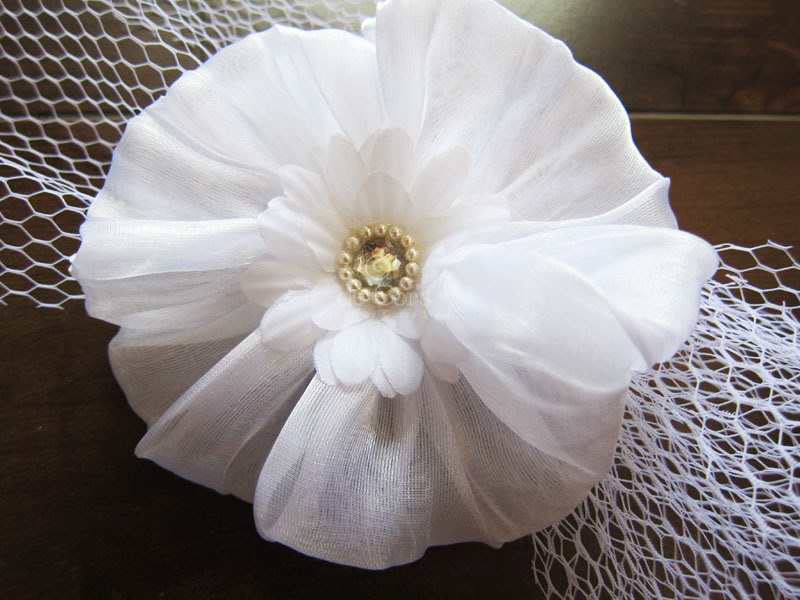 I thought it'd be great if she could choose which flower to wear during photoshooting, so instead of sewing the fabric flower onto the veil, I made it into hair clip, so she could swap.